This is a fantastic episode with a great script and some very witty lines - a real challenge to anyone who might say that Ray Daley episodes aren't a patch on the Terry McCann years. Substitute Ray for Terry and rewind a few years and this would have worked just as well there. Arthur is clearly doing his best to get full membership in order to get some contacts at the golf club, with 'Previous' (Trevor Peacock) doing all he can to scupper Arthur's chances. Then there is the local nutter Denny Willis, who is after Arthur for a deal that when badly wrong and left him well out of pocket. Then there's the old bill, desperate to sell the police bus to Arthur, who after purchasing it starts 'Daley Tours' which soon proves to be more aggro than it's worth. We soon discover there are serious shenanigans regarding property development at the golf club and that Morley is in serious shtook after the sale of the bus to Arthur turns sour with his superior. What I really like about this one, is Ray really has to be a minder and fair play to him, he is willing to stick his neck out for Arthur and go up against Denny and his heavies. When Arthur takes the bus back the police station and impersonates some sort of Special Branch type officer in order to save Morley's bacon - this is priceless. Also Previous recording "Can you get me bail?" as Denny arrives at the end is great timing. Also, the picture on the right above - Arthur's face as Ray seems to consider Denny's offer at the end is truly superb. A few anorak points - the extra who asks Arthur to take his shoes at the pool off was called 'Gary' and although Stephen Tompkinson is credited at the start he fails to appear. This has all the ingredients of a great Minder episode to me - a con, dody motor, a villain, a foreign type that Arthur can't handle, a punch up, a bird and a bit of corruption going on. Lorraine even gives Ray the same story about "loyalty to Arthur" as we've heard elsewhere in Minder too. Top episode well worthy of 9/10 from me. Perkins: Quite frankly, a round wouldn't do your chances any harm. Arthur: What, another one? I bought so many since I been coming here I'm thinking of taking out a second mortgage. Arthur: You are still sadly lacking Raymond in Euro vision. This place is stuffed full with foreigners, all members of the EEC. It's just as well you have me grooming you for single currency decade. Ray: You can say that again I am nearly down to single currency now. Arthur: Next time you see me here, don't know me, right? Previous: Fair enough Arthur, shall we say a tenner? Superintendent: It comes with a full service history. Arthur: I assume that naturally, Mr Morley knows my standards! Dave: This is well out of order. You do not ruck in a boozer! Arthur: They wanted me to play golf! Yep, absolutely love this one! Arthur: Yeah by all means, there's a quid on account. The rest on satisfactory completion of the agreement. Yes, great ep...also like the scene where the bus breaks down and Arthur starts making up the story of the statue near by....and goes on about how the soldiers preferred to attack on the weekend (or similar)...as "all the lads were on double time" ! Class. It is some years since I've seen it, but I liked this episode. The kind of coach operation enterprise that Arthur created was true to life at the time. It would be very difficult to do now. Watched this on Friday night, another cracking episode. I liked the way the Rocky character appeared. You see the tatooed, heavily built guy in the swimming pool, then we discover Rocky is the weedy looking one who wears glasses. I love the fact Arthur is a bit light with the cash that he gave back to Rocky for the coach, due to wear and tear, even though it hadn't moved. Although some weak storylines, I don't think this was a bad little series at all, just a little more thought into a few of the scripts and it could have been a cracker of a series. Glad you liked this one daz - personally one of the best Ray Daley episodes if you ask me, top 5 for sure. I was really hoping for a major ruck at the end. A few rucks wouldn't have gone amiss in a few of series eight episodes. I think it may just have been the times changing that we didn't see much fights, which is a shame really. There are a few rucks to come, some of the best in series 10 in my opinion. For me, there was a scene in this episode that was life imitating art! When Arthur says on the coach "there are the flats where rays cousin lives" the tourists start snapping away with their cameras, not knowing what they are taking pictures of! A few years later I was in the bar of a hotel in luxembourg and talking to me at the time girlfriend and saying to her "this is BIT BURGER Beer, it is brewed not far from where jenny lives" (talking about an old German friend of mine) I noticed a bloke looking at us from another table. Soon he was joined by some other people and in a thick texas accent he told his mates "TRY THIS JOY-MAN BIT-BURGER BEER,IT IS BREWED NEAR WHERE JENNY LIVES"
A few anorak points - the extra who asks Arthur to take his shoes at the pool off was called 'Gary' and although Stephen Tompkinson is credited at the start he fails to appear. Everytime I read it I have been meaning to ask: What do you mean by "anorak" ? Googling it only reveals the translation I also know, some kind of windbreaker. But this cant be meant when you use it here, can it? Anorak = over knowledgeable nerd who knows (arguably) too much information about something and cares about every single intricate detail. I don't know a precise German expression for this but I believe it is probably "Fachtrottel" or even simply "Freak/Nerd". An 'anorak point' is an intricate detail of interest to those like me i.e. who don't get out much aka fellow Minder anoraks who are super fans. Yeah, thought so from that description wikipedia. I only found this when I googled "Anorak Slang". Here's an article from the TV TIMES of the week, donated by a kind fellow forum member. A great episode! I love Arthur's tour commentary and comments on the Charge of the Night Brigade. Another highlight for me was Arthur's saving Morely's hide over the police bus. Pure brilliance as only George Cole could deliver. I live near Pittsburgh and was amused to see a Pittsburgh Pirates Baseball team pennant hanging in the lockup. I wonder what sort of dodgy deal Arthur was involved in to get them. Reading that article it does make me wonder what would have happened if Minder had gone to the BBC. This as jno and others have stated, one of the best from the Ray Daley years. As we saw in 'Caught In The Act, Fact', Arthur was not a golfer and only knew what another type of 'round' was. Agree entirely, this is a top Ray Daley episode, only missing a punch up at the golf club, which would have been superb. 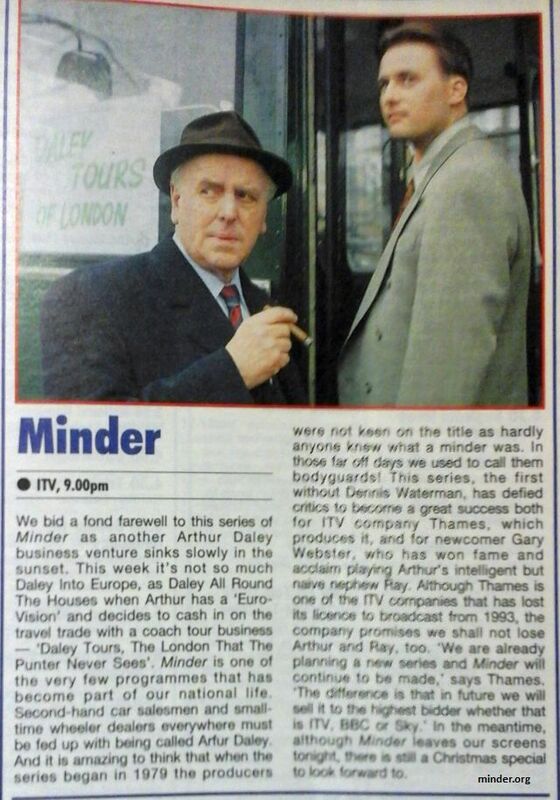 One of the best episodes of the Ray era and more importantly one of the best episodes of Minder.